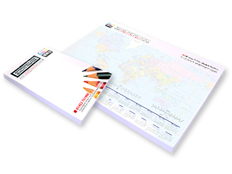 Full Colour Note Pads and Desk Pads are some of the very best promotional tools you can give your customer, because they are genuinely useful and keep your name and contact details right in front of them. Choose any size from an A2 desk pad to an A6 note pad. Read the FAQs, "i" information and artwork preparation guide for lots more information. Most note pads and desk pads are 50 pages to a pad. If you need to keep costs down - maybe these are for a conference or you just need a lot of them - then it's common to reduce the number of pages to 25. If you need any other number of pages, please call the helpdesk on 01452 751900. All options are good quality white paper. GSM stands for grammes per square meter, so you have the option of a standard 80gsm or a heavier 100gsm. The recycled paper is made from 100% de-inked post consumer waste. You are welcome to paper samples, please call the helpdesk on 01452 751900. If you'd like your pads made with any other type of paper, please call the helpdesk on 01452 751900 for a chat about what's available. There's no minimum quantity or specific numbers you have to order, so just order what you need. To keep the costs as low as possible, we automatically figure out the most cost effective way to print your job (i.e. litho or digital) and quote you that price. Once you get into higher quantities, the job is printed on a large printing press and the cost per item gets a lot cheaper. Important note: if you are sending a PDF, you MUST read the artwork preparation guide first! If you don't have any artwork to send us, we can design it for you. Just choose the "Please design it for me" option when placing your order and then call the helpdesk on 01452 751900 to get the ball rolling. We'll need a reasonably precise brief from you for our graphic designer to work from. Common sense rules apply! You must provide us with your logo and any other original artwork required, plus any photographs that you want to use. If you need it, we can provide reasonably priced licensed stock photography for you, but please bear in mind that you may not be able to get exactly the photograph that you want. We don't include creating any original artwork in the design price, for example illustrations or a new logo, but we're happy to quote you for this type of work if you need it. All graphic design work must be paid for before we can start work. Important note: if you want to add design work to your order and need it done pronto, it's best to discuss this with us first. A design will generally take about a week to complete and it's unlikely that we can drop everything and work on your job right this minute, but of course we'll always do our best to help. Call the helpdesk on 01452 751900 for a chat. These are working days to print and you pay a slight premium if you want your order faster. Please remember to add transit (delivery) time to this and remember that these are working days to print and do not include weekends or bank holidays. We cannot schedule your order until it is has been paid for. Delivery is normally the next working day AFTER the job is printed. If you want a Saturday delivery, call the helpdesk to get that cost added to your order. We classify Monday-Friday as working days, Bank Holidays are not working days. This is NOT a guaranteed next day delivery service, though over 99% of all deliveries do get delivered next day. We only deliver to the UK as standard, but the helpdesk can usually get you a price to deliver anywhere in the European Union. Please call them on (+44) (0)1452 751900 to discuss this. We do not deliver outside of European Union countries. Attractive and functional Full Colour A6, A5, A4, A3 and A2 Desk and Note Pads sit right in front of your customer every day, making them one of the very best promotional tools available. Desk and Note Pads are low cost gifts that are actually useful to your customer and make sure that your contact details are always close at hand for when your customer is ready to make a purchase! Because we cost effectively print exactly the quantity you require and offer 25 sheet as well as 50 sheet pads, you can order exactly what you need with no need to store boxes and boxes of pads just to get a good price. If your artwork is portrait orientation, we'll assume it's a notepad and will glue the top (head). If it's landscape orientation AND A4, A3 or A2 we'll assume that it's a desk pad and glue at the bottom (foot). Gluing at the bottom helps to stop the pages curling up in daily use. If you want your pad glued in any other way, call or email the helpdesk and let us know what you want. Our pads all come with a sturdy, thick cardboard back. The back is made from 100% recycled material. How do I find out what all the options mean? I'd like to talk to someone about this, what number do I dial? What can I use these for? I don't have any artwork, can you help? How are these glued? What kind of back do the pads have? Can I get a sample?